I'd wanted to read this since it came out but it wasn't very high on my wishlist until I managed to score a copy from a giveaway ran by our own Anjali! I have a very love/hate relationship with John Green books, they're rather a touchy subject with some book lovers. Some love them, some hate them, and some hate them because so many people love them. I'm not one of those, I really liked a few of his books that I read back when I was 18/19 (cough, I hate to say it but before the movie came out and everything went boom). Looking for Alaska, and The Fault in our Stars was great, really lovely to read and enjoy. 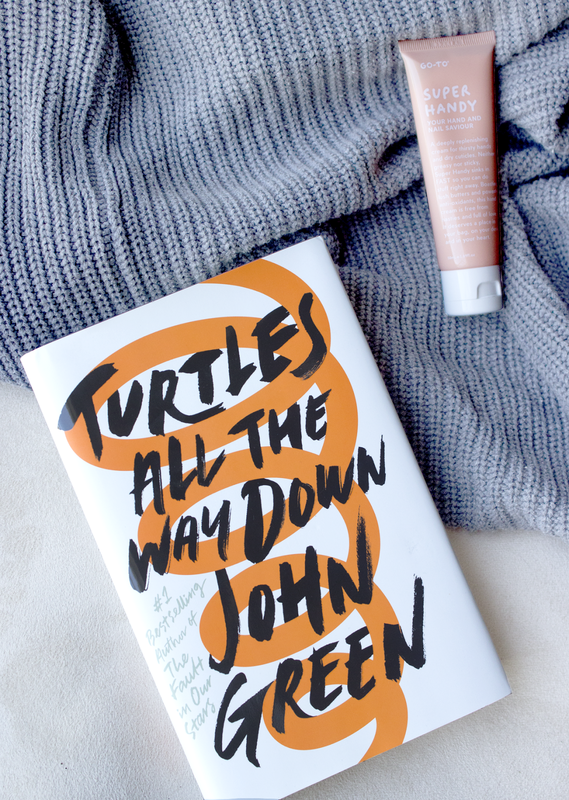 Paper Towns and An Abundance of Katherines were the last two I read and I was not a fan, because of that my view on John Green books sort of changed. Then The Fault in our Stars movie came out in 2014 and I wasn't the biggest fan of that so ya know it didn't help. However because it's been so long, I've grown up and while I may not be his target audience anymore I thought I'd give this one a go. As mentioned before it wasn't the top of my tbr pile because of my thoughts of some of his other books, Anjali pushed me into it... and I did really enjoy it! I have to say when I received it and read the blurb on what it was about I was slightly put off but I jumped in and in reality, without giving spoilers, the whole 'murder mystery disappearance' storyline of the blurb is only really a general subplot floating the real story. A whole lot more important stuff happens than that. Half the time you forget the chase is on. While in some cases this may be thought of as 'why the hell did he even bother with that storyline then?' I think it helped to get the real story going where it needed to be going. The main thing I took from this book though was Aza's mental health journey. While I've never had anxiety as bad as she struggles through a few of her moments definitely resonated with me. John Green definitely has the spiral metaphor down, there have been definite times in my life where my thoughts have just spiralled down and down and down, Turtles All The Way Down. I've come to realise the reason the main plotline isn't very important is that we're seeing the story from Aza's mind. She can't even get through lunch without her anxiety spiralling her thoughts so of course the plotline can be easily distracted. It makes the entire book very relatable if you've gone through anything similar to what she's going through. Plus they have tuatara which, living in NZ and tuatara being from NZ, made me squeal a bit. I then wondered why it was called Turtles All The Way Down and not Tuatara All The Way Down, but you then get to that scene and the penny drops and there's a magical moment where they say the name of the book and everything clicks and it's wonderful. You know the moments right? This would usually be the part of a comedy show where the main character breaks the fourth wall and looks into the camera and winks at the audience.